Product code: ES8364cc Categories: Modern & Retro Jewellery, Modern Brooch. The term “Tutti frutti” comes from the Italian word meaning “all fruits” and is a description used to describe jewellery, often brooches or dress clips, that are often set in a somewhat flamboyant over-the-top manor with multiple coloured gemstones and diamonds, as can be seen here in this magnificent platinum tutti frutti brooch set with diamonds, sapphire, rubies and emeralds. From near or far, there is no doubt that this brooch is magnificent to behold and the amount of time that would have been needed to hand make this combined with sourcing the gemstones and planning on where they would be placed in the brooch would have been immense. In total there are an incredible 43 round brilliant cut diamonds, 9 baguette cut diamonds and 4 pear cut diamonds that come together to total 3.51 carats and all of these diamonds are white, and then there are 11 yellow diamonds that add an additional 1.32 carats, resulting in an astonishing total of 4.83 carats. And then to create an explosion of colour there are 6 emeralds, 4 sapphires and 4 rubies that total 0.58 carats, 0.30 carats and 0.64 carats respectively. The magnificent way this brooch has been created gives the impression of a bowl of fruit with the base so beautifully set with the angular baguette cut diamonds leading up to the “bowl” section with the fine and elegant scroll design and then of course that incredible palette of colour from the rubies, sapphires, emeralds and yellow diamonds, and sparkle from the white diamonds sitting on top. Entirely hand made in platinum, the brooch measures 39.8mm across by 27.8mm and no matter the occasion, no matter the time of day and no matter who sees it, there is no doubt that it will always be admired and appreciated from near or far. 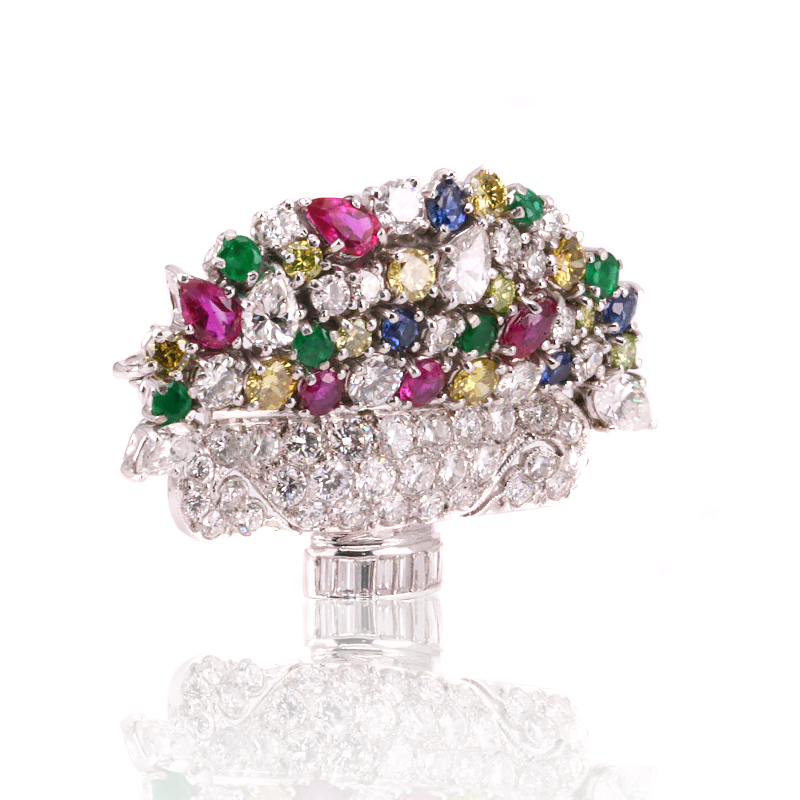 The term “Tutti frutti” comes from the Italian word meaning “all fruits” and is a description used to describe jewellery, often brooches or dress clips, that are often set in a somewhat flamboyant over-the-top manor with multiple coloured gemstones and diamonds, as can be seen here in this magnificent platinum tuttu frutti brooch set with diamonds, sapphire, rubies and emeralds.